SHADOW CONSPIRACY RAPTOR FREECOASTERS ARE IN STOCK NOW and ready to roll! Shadow Conspiracy Raptor Freecoasters have finally arrived! Click HERE to view available options and a complete list of replacement parts! Freecoasters are most definitely in high demand these days. Shadow delivers the Raptor Freecoaster with replacement parts readily available here at MASTER BLASTER. 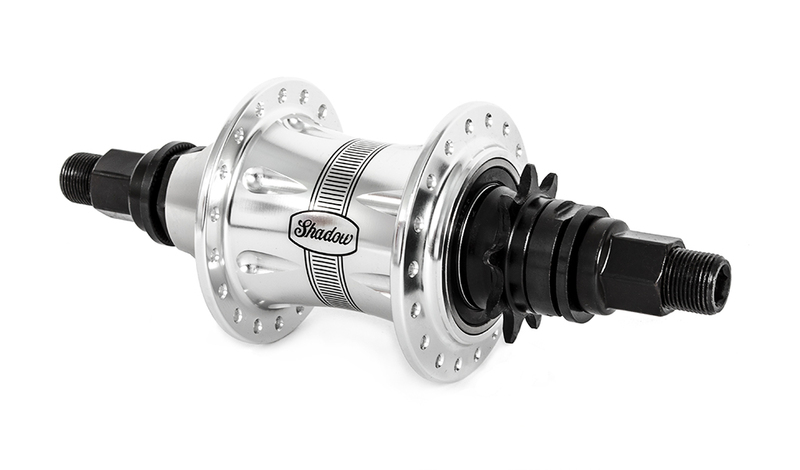 Shadow has taken the best features of the KHE internals and put them into one hub. In addition there are plenty of updated features to make this hub more durable and run with less resistance than other hubs on the market. In addition this hub offers consistent engagement which is super important when looking for a freecoaster hub. This hub features a Raptor CNC 6061 alloy hub shell. A 14mm solid cro-mo male axle with 8mm hex broach. Cro-mo cones and inserts for long term durability. 9T 1pc CNC cro-mo driver with needle and cartridge bearings. Angular Contact Bearing and oversized cartridge bearing in the hub shell. Thrust bearing behind the clutch reduces drag during rollbacks. Weight: 23.2 oz. We carry all replacement parts for this hub. This hub comes in polished silver (shown) and black. Contact us before buying if you have any questions about this hub. « MASTER BLASTER PLANET logo t shirts are in stock now in mens small – xl!